Each report item type has a unique Item Editor. This guide describes the settings and options available in each one. 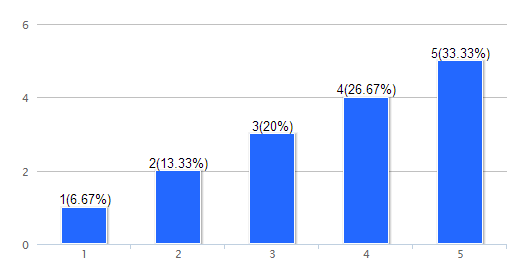 Summary Charts are used to display the data from multiple choice questions, such as Radio Buttons, Checkboxes, Rating Scales, Drop Down Lists, Sliders, and Rank Order items. 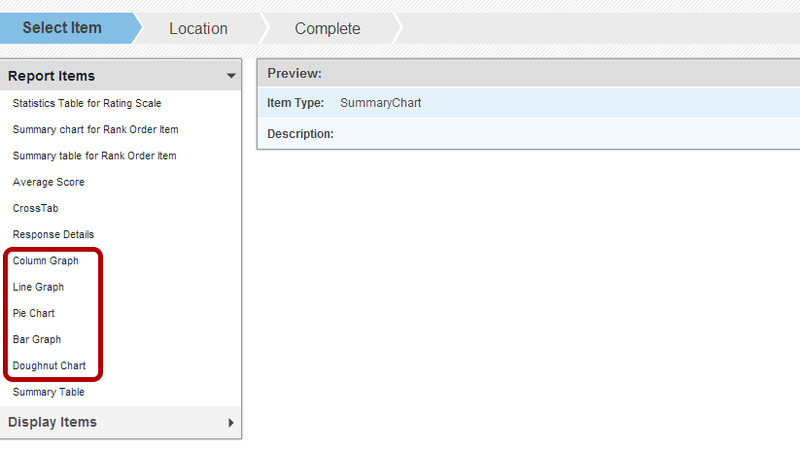 Summary Charts are interchangeable, which means you can change the chart/graph type without having to add a new item. 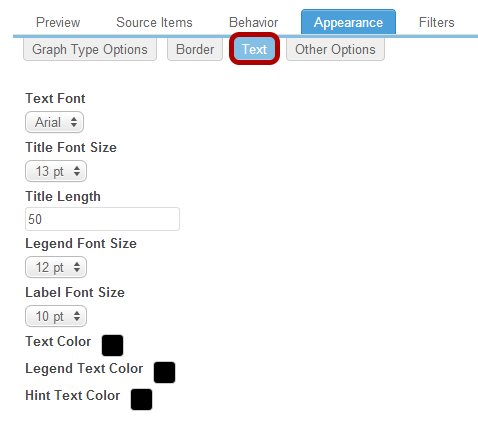 The chart type can be changed in the item editor under Appearance >> Graph Type Options >> Chart Type. A sample of your Summary Chart is displayed on the Preview tab. NOTE: The item preview displays with SAMPLE DATA. 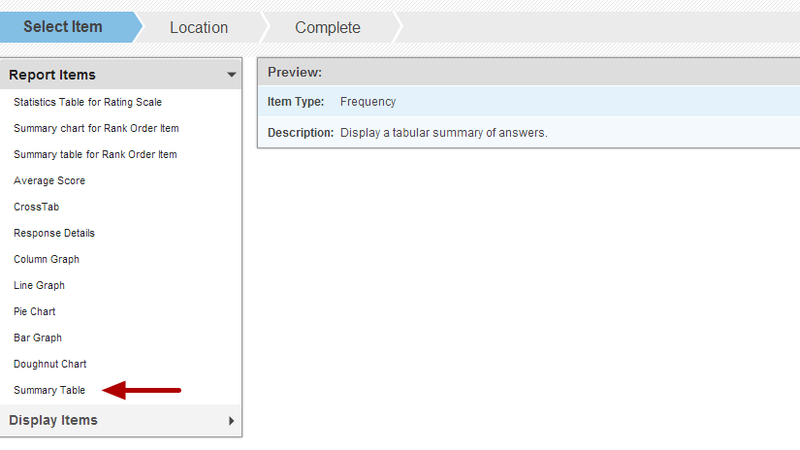 To view the item with actual survey data you must run your report. 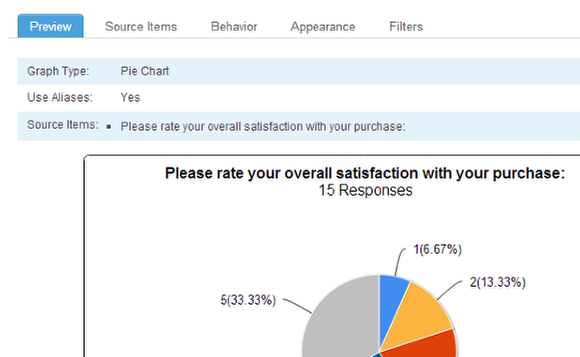 Choose the survey item source(s) you wish to include in the Summary Chart on the Source Items tab. Select one or more sources from the list of available items on the right and click the Add Item button to add these source items to the Summary Chart. To remove an item from the Summary Chart, select it from the list of source items on the left and click the Remove Item button. If you added multiple source items to the Summary Chart you have the option to designate one of them as the Primary Source Item. 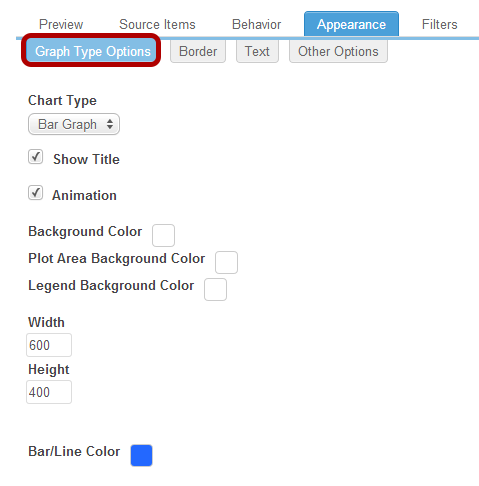 When a primary source item is selected, only that item’s variable labels will display on the chart/graph. If no primary source item is defined, all source variable labels will display. 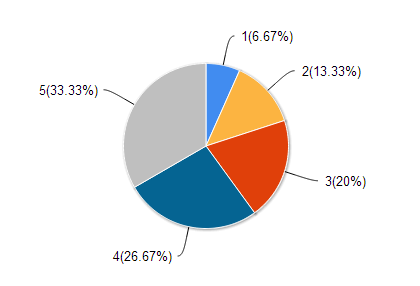 NOTE: Multi-source Summary Charts work best when displayed as Column Graphs or Bar Graphs. Aliases: if you created any aliases for survey question or answer text within the Survey Editor, this is where you can apply the aliases to display in your report in place of the original survey text. Applying aliases is useful for shortening long survey questions or describing image answer options. 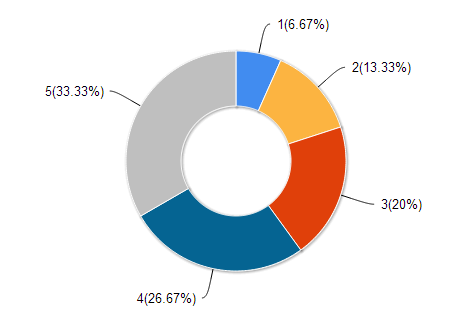 Display Statistics – Will display statistics about the number of responses gathered. 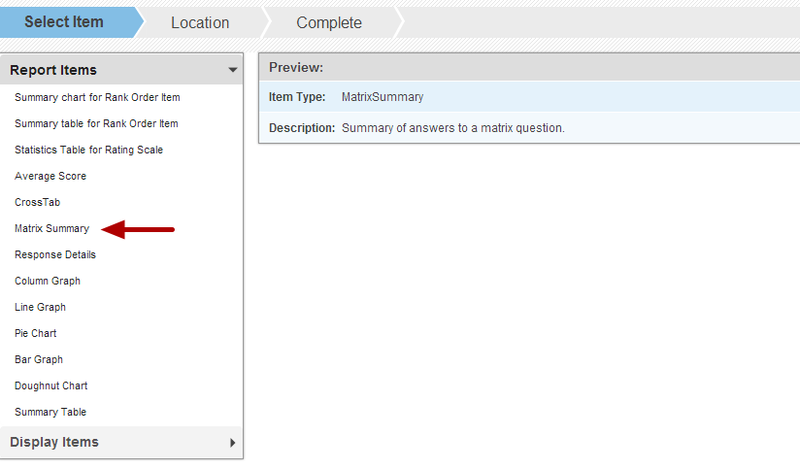 Display Answers Summary- Will display the answers for the item as well as, depending on the question type, a number of times selected, percentage of total responses that selected the answer or the score for each answer. 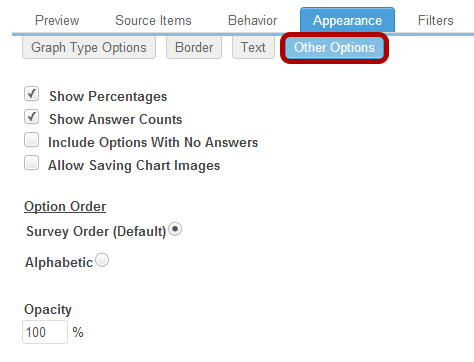 Other Options: If you enabled the “Other” option in the survey source item, allowing respondents to enter their own answer instead of selecting on of the ones you provided, this is where you can choose how you want the “Other” answers to be displayed on your Summary Chart. 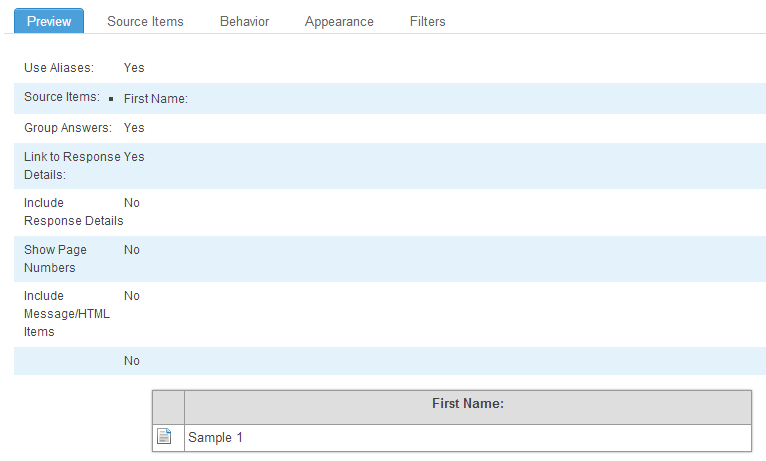 Use the Appearance tabs to customize your Summary Chart. Under Margins, you can adjust the space between the chart and the border. If you generated filters in the Filters Manager you can apply them here. **For more information on report filters, view the Report Filters Guide. The Summary Table report item displays a tabular summary of survey item responses. This is the most versatile report item type because it can be used for almost every reportable survey item with the exception of Matrix items. A sample of your Summary Table is displayed on the Preview tab. 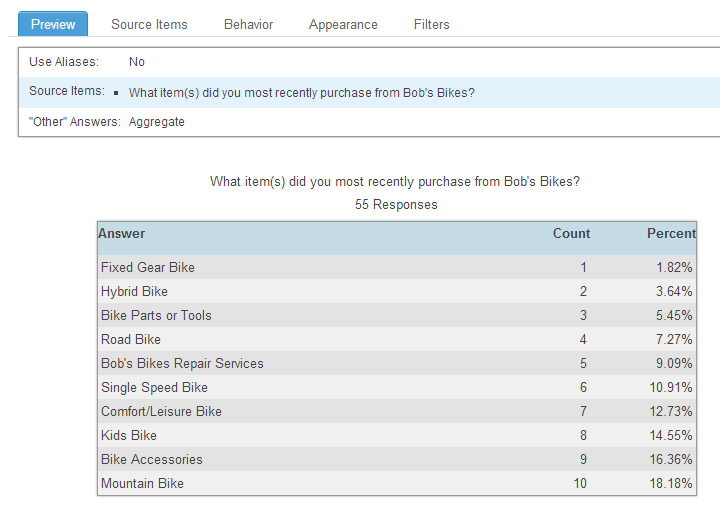 Choose the survey item source(s) you wish to include in the Summary Table on the Source Items tab. Select one or more sources from the list of available items on the right and click the Add Item button to add these source items to the Summary Table. 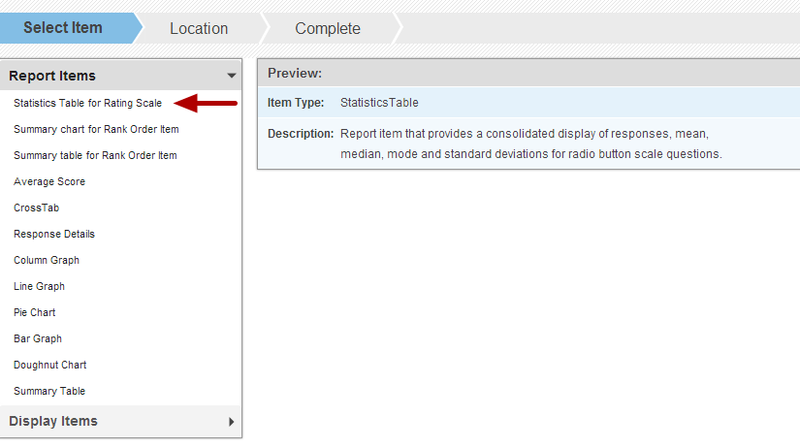 To remove an item from the Summary Table, select it from the list of source items on the left and click the Remove Item button. For more information on report filters, view the Report Filters Guide. This report item type is designed for Rating Scale items only. It provides a consolidated display of Rating Scale source item responses mean, median, mode, and standard deviation. 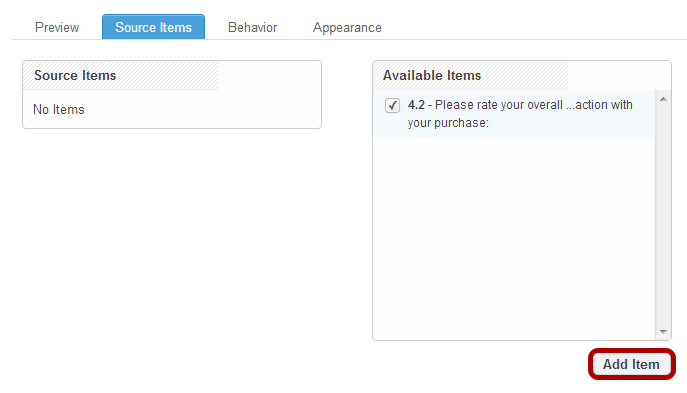 A sample of your Statistics Table for Rating Scale is displayed on the Preview tab. 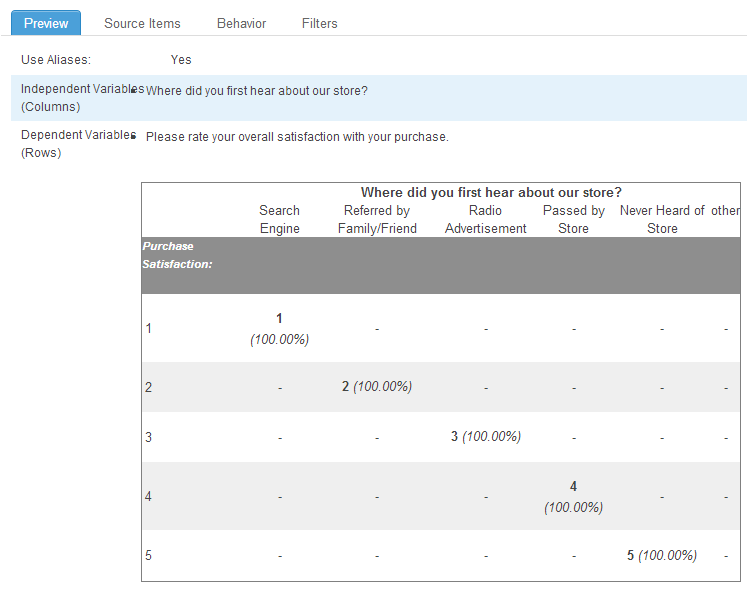 Choose the survey item source(s) you wish to include in the Statistics Table for Rating Scale on the Source Items tab. 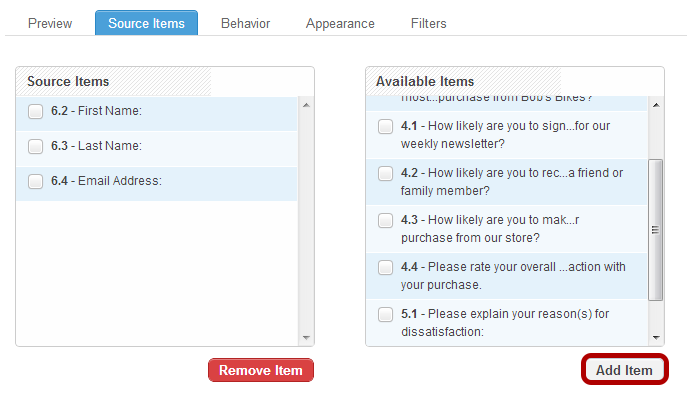 You will only see Rating Scale items in the Available Items box. Select one or more sources from the list of available items on the right and click the Add Item button to add these source items to the Statistics Table for Rating Scale. To remove an item from the Statistics Table for Rating Scale, select it from the list of source items on the left and click the Remove Item button. Calculation: Determine which calculations Checkbox will make based on the available response data, including Responses, Mean Values, Median Values, Mode, and Standard Deviation. 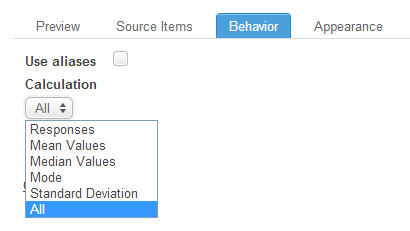 Choose which calculations to display on the Statistics Table for Rating Scale item. This report item type is designed for Rank Order items only. It is a summary chart that shows the Total Score (sum of the ranked item options) for each answer. Top positioned options have a higher rank. 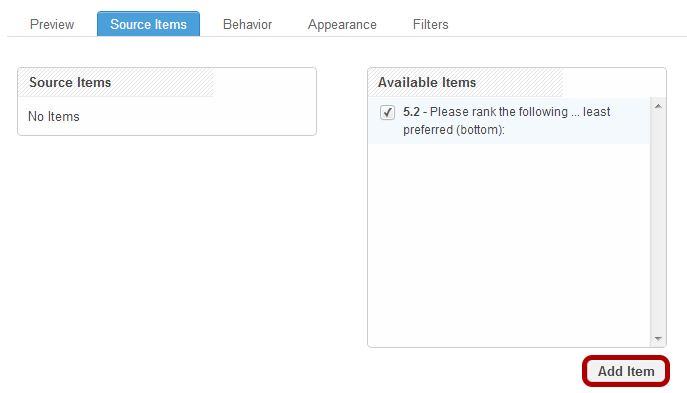 A sample of your Summary Chart for Rank Order Item is displayed on the Preview tab. 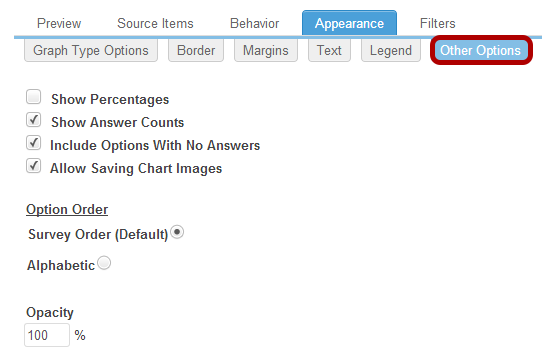 Choose the survey item source(s) you wish to include in the Summary Chart for Rank Order Item on the Source Items tab. You will only see Rank Order items in the Available Items box. Select one or more sources from the list of available items on the right and click the Add Item button to add these source items to the Summary Chart for Rank Order Item. 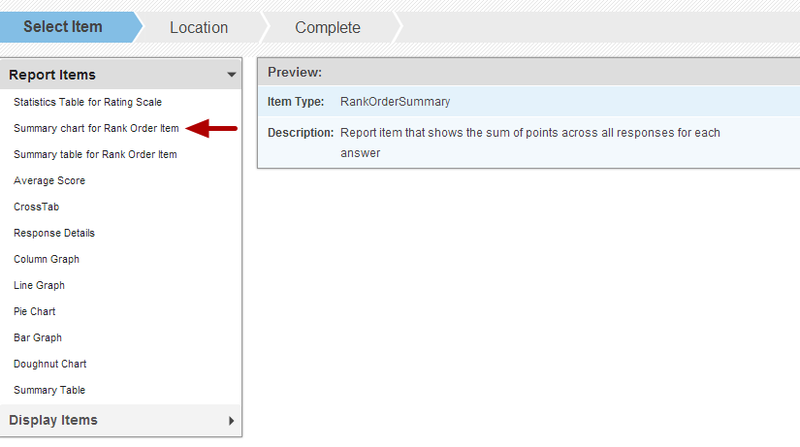 To remove an item from the Summary Chart for Rank Order Item, select it from the list of source items on the left and click the Remove Item button. On the Behavior tab, you have the ability to enable Aliases. If you created any aliases for survey question or answer text within the Survey Editor, this is where you can apply the aliases to display in your report in place of the original survey text. Applying aliases is useful for shortening long survey questions or describing image answer options. This report item type is designed for Rank Order items only. It is a summary table that shows the Total Score and Overall Rank of the answer options. A sample of your Summary Table for Rank Order Item is displayed on the Preview tab. 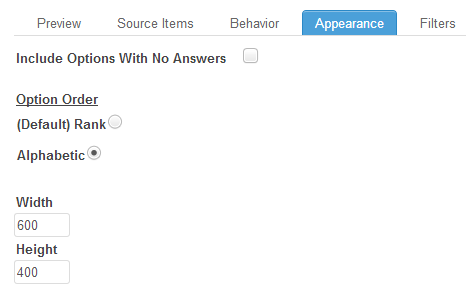 Choose the survey item source(s) you wish to include in the Summary Table for Rank Order Item on the Source Items tab. You will only see Rank Order items in the Available Items box. Select one or more sources from the list of available items on the right and click the Add Item button to add these source items to the Summary Table for Rank Order Item. 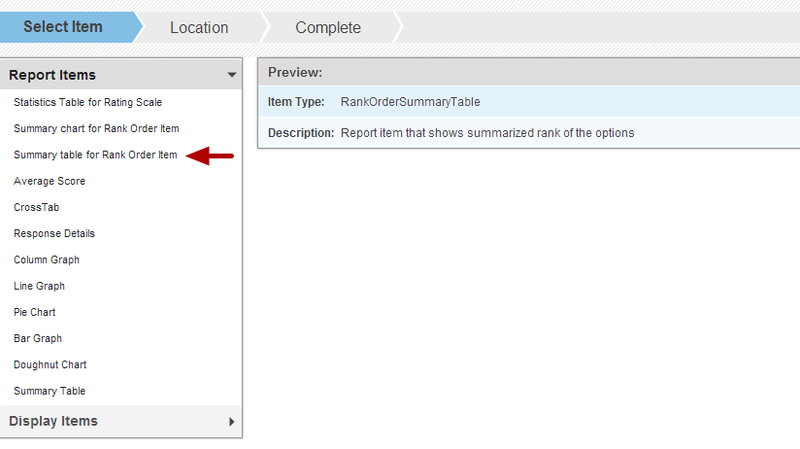 To remove an item from the Summary Table for Rank Order Item, select it from the list of source items on the left and click the Remove Item button. If your Checkbox survey has Scoring enabled, which is the ability to assign question answers numeric point values, you can add an Average Score item. This item displays the average score for one or more questions. A sample of your Average Score Item is displayed on the Preview tab. 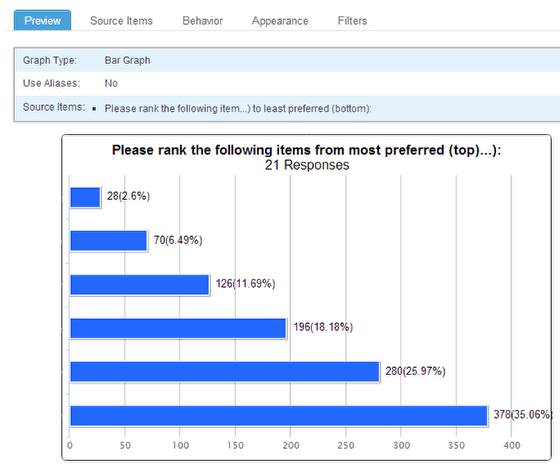 Choose the survey item source(s) you wish to include in the Average Score Item on the Source Items tab. Select one or more sources from the list of available items on the right and click the Add Item button to add these source items to the Average Score Item. 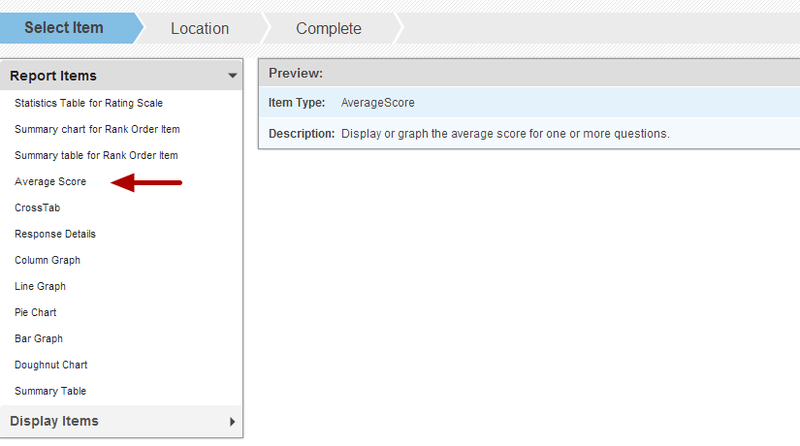 To remove an item from the Average Score Item, select it from the list of source items on the left and click the Remove Item button. 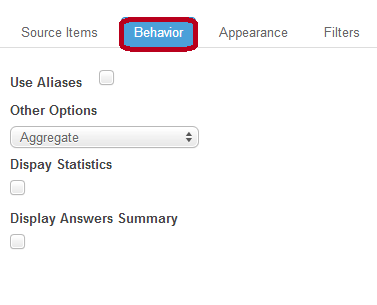 On the Behavior tab you have the ability to enabl Aliases. If you created any aliases for survey question or answer text within the Survey Editor, this is where you can apply the aliases to display in your report in place of the original survey text. Applying aliases is useful for shortening long survey questions or describing image answer options. The CrossTab report item compares the results of two source items. 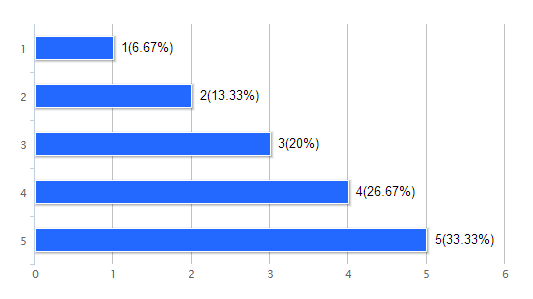 Choose the survey item source(s) you wish to include in the CrossTab Item on the Source Items tab. 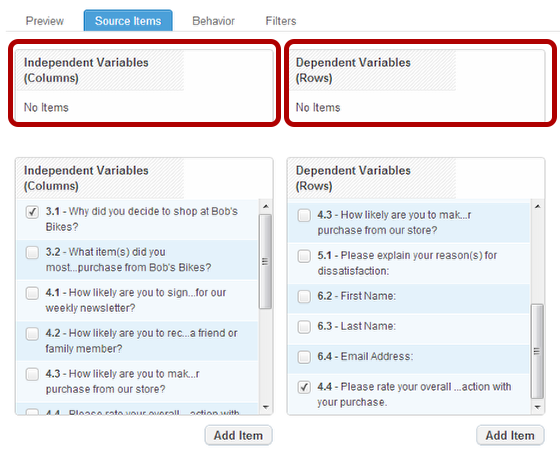 You must select at least one independent variable (columns) and at least one dependent variable (rows). CHECKBOX TIP: As a general rule, the control group or independent variable is on the X-axis (such as age, gender education, etc.) 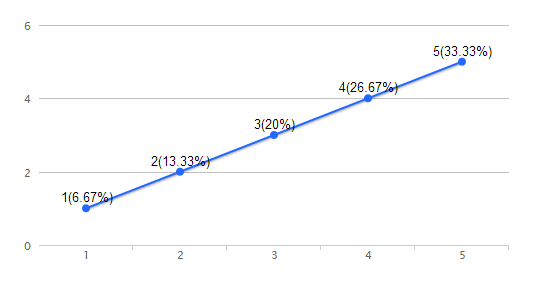 while the dependent variable or group under study is located on the Y Axis. Sources are selected from the bottom two boxes. 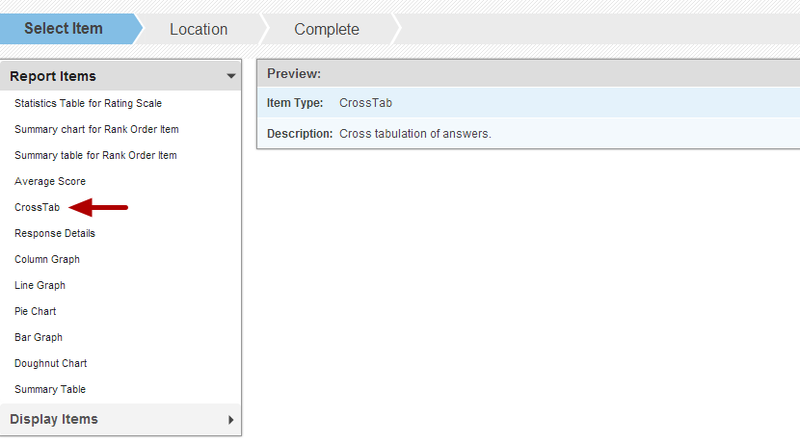 Click the Add Item button to add these source items to the CrossTab Item. To remove an item from the CrossTab Item, select it from the source items at the top of the window and click the Remove Item button. On the Behavior tab you have the ability to enable Aliases. If you created any aliases for survey question or answer text within the Survey Editor, this is where you can apply the aliases to display in your report in place of the original survey text. Applying aliases is useful for shortening long survey questions or describing image answer options. 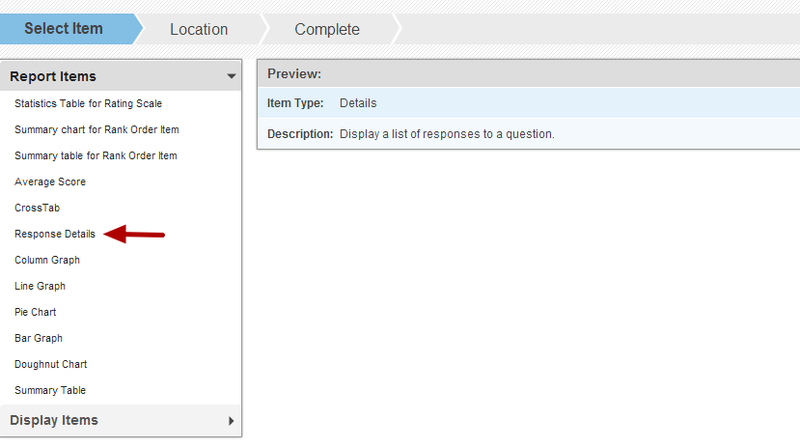 The Response Details report item type is used for open response questions, including Open-End Multi-Line and Open-Ended Single-Line Text items, and any “Other” fields where respondents entered their own answers instead of selecting one of the ones provided on the survey item. A sample of your Response Details Item is displayed on the Preview tab. 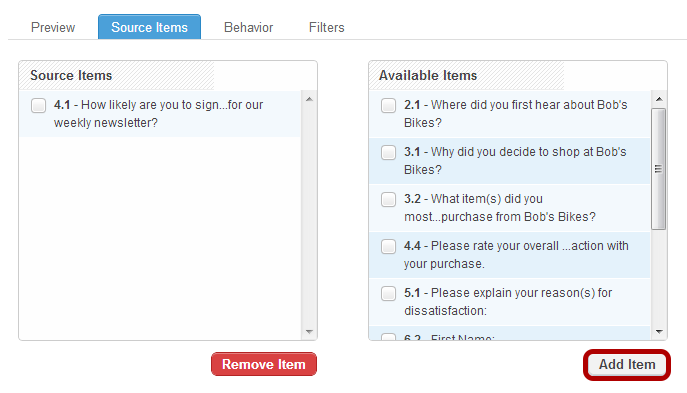 Choose the survey item source(s) you wish to include in the Response Details Item on the Source Items tab. 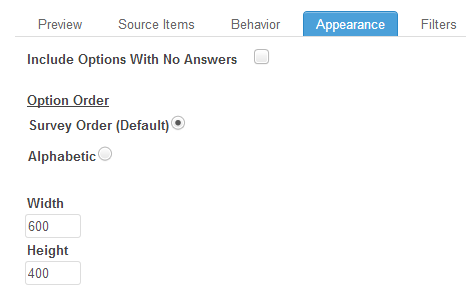 Select one or more sources from the list of available items on the right and click the Add Item button to add these source items to the Response Details Item. 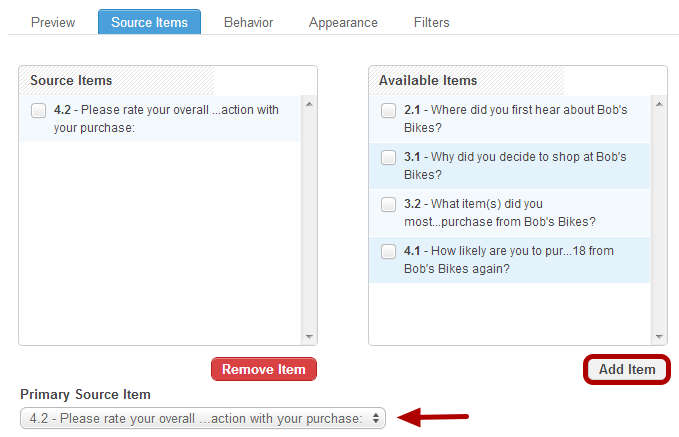 To remove an item from the Response Details Item, select it from the list of source items on the left and click the Remove Item button. 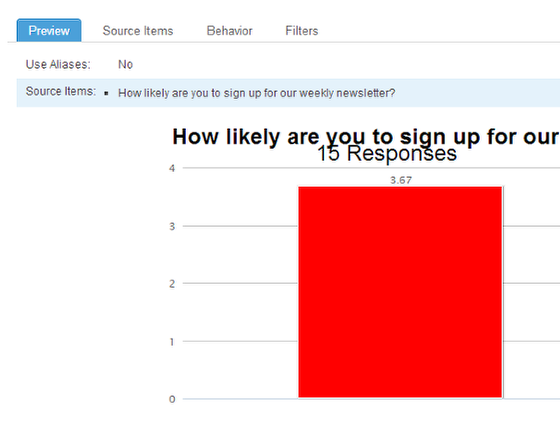 Link to Response Details: Each open response will display a link to that respondent’s response details. Enable Aliases: If you created any aliases for survey question or answer text within the Survey Editor, this is where you can apply the aliases to display in your report in place of the original survey text. Applying aliases is useful for shortening long survey questions or describing image answer options. Group Answers: If you included multiple sources on the Response Details item, grouping them will display the responses in a horizontal table where each source has its own column. Grouping answers is useful if you are creating a Response Details item for contact information. For example, let’s say you grouped the source questions: “First Name:”, “Last Name:”, and “Email Address:” If you do not enable grouping on the Behavior tab, the item will appear as the image above, with each source stacked in a list. When grouping is enabled on the Behavior tab, the responses will appear in a table, each source having its own column as in the image above. 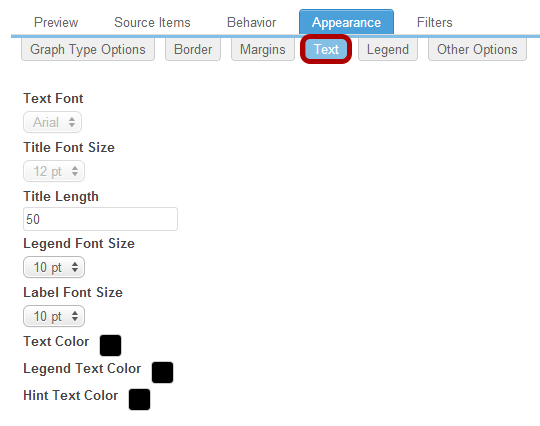 On the Appearance tab you have the ability to adjust the table width. This report item type is designed for Matrix items only. It is a summary table that shows the rating summary and average rating of answers to a Matrix question. This report item will only appear in the Report Items list if there is a Matrix Item in the selected survey. A sample of your Matrix Summary Item is displayed on the Preview tab. 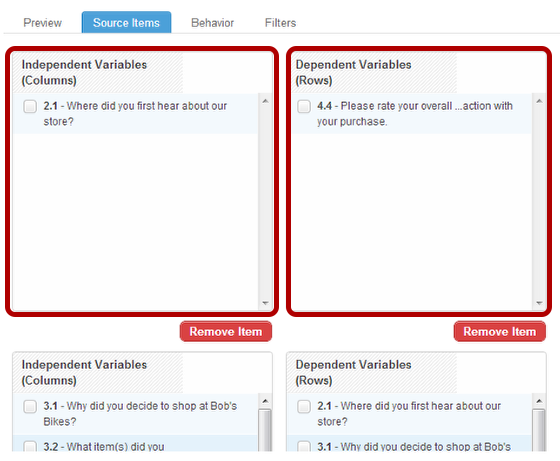 Choose the survey item source you wish to include in the Matrix Summary on the Source Items tab. You may only select one source.